As boomers age and remain active, interest is soaring in trekking poles as well as walking canes and hiking sticks. Sales of the aluminum or carbon variety, sold singular or in pairs at sporting good stores and websites has increased dramatically. Consumers can find a wide degree of adjustability, enhanced shock absorbers and even devices on the handle that positions a camera to capture photos of the wilderness. 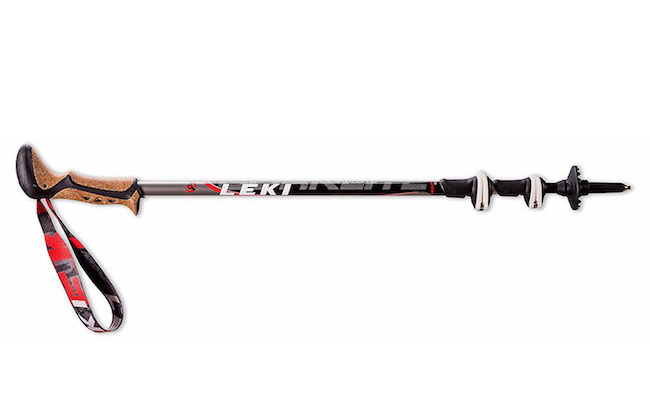 These trekking poles, also referred to as walking poles, were introduced as a year-round means of turning walking into a total body exercise similar in both appearance and benefits to cross-country skiing. Trekking poles, typically made of aluminum and sometimes an aluminum-carbon blend, have removable rubber tips for quieter walking on pavement. 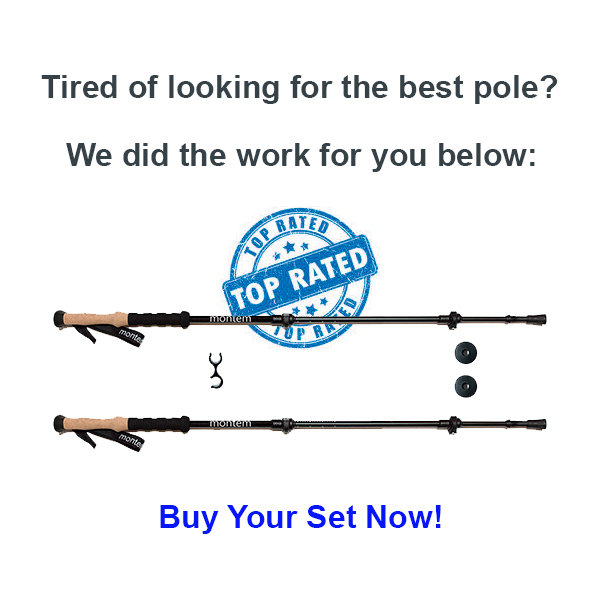 Most poles have hand straps to give leverage with each stroke, and come in either fixed length or adjustable-height models, which companies say are great for people who vary the terrain they walk on and for beginners who need to experiment to find the ideal height. While walking canes and walkers remain the most often prescribed assistive devices for those needing to take weight and stress off of the joints of the hips, knees and feet, as well as for those in need of balance aids, many are discovering that a pair of specially designed trekking poles can provide an even more effective assist. 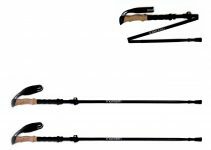 Need help choosing the best trekking poles? Let us help here. Walking pole users are enthusiastic regardless of age or ability, among the most enthusiastic users may be those who have traded in their canes and walkers for a pair of these sporty looking poles. Maggie Smith, who did a walking pole pilot project at a retirement community in New York, NY says, “People with canes and walkers tend to see themselves as ‘invalids’, but the same people with walking poles more often feel like ‘athletes'”. For ten weeks, 10 seniors New York averaging 75 years of age traded in their walking canes and walkers for trekking poles. “Those who traded in walkers immediately began walking with a more upright posture and their gait pattern went from the ‘walker shuffle’ to a more normal walking gait” according to Maggie Smith. The psychological benefits may have been as important as the physical benefits. Participants walked with greater confidence and a smile of satisfaction on their faces according to Smith. Those who traded their walking canes for a pair of the poles immediately felt the benefit of an addition point in contact with the ground and using the poles quickly began to correct the leaning that generally comes with cane use. The newest technology include quick, external locks on two sections of the trekking poles that are easy for people with arthritis to operate and easier to adjust for uphill and downhill trails. Trekking poles enable walkers to go farther along forest trails by spreading their weight onto two lightweight devices, which helps alleviate pressure on fragile hips and knee joints. Senior citizen centers and YMCAs offer classes across the country to teach proper technique. Michael Jones, 78, a hike leader in Los Angeles, says he and his wife use aluminum walking sticks on trails. “There is a lot of value to the trekking poles,” says Jones, who likes the stability that the devices lend for walking over rocks and through small streams on hiking trails. But poles aren’t just for hikers. They can also be a godsend to injured weekend athletes. 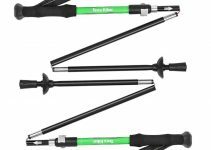 Patrick Johnson, 65, of Miami, FL found the Nordic-style trekking poles with rubber tips for concrete use kept his exercise regimen active after a painful setback in 2012. “All my muscles atrophied after knee surgery,” says Johnson, who traded his inline skates and Cannondale bike for Nordic poles. They helped him walk up to 20 miles a day for two years until his legs healed sufficiently to resume cycling. Johnson now teaches classes in pole walking along South Beach, FL. “The three things a physical therapist looks at with a client is structure, issues and goals,” says jones, adding that height, weight, adjustability and grip are factors. Specialized poles can accommodate hand arthritis, Parkinson’s and inflamed hip abductors.